This is the place to begin pursuing your dreams, surrounded by an environment that encourages you and enables you to excel. Founded in 1923 as a United Methodist institution, McMurry exists to support students on the individual level, providing resources for spiritual, intellectual, and social growth. Here small class sizes and hands-on learning mix with an energetic campus community and lots of school spirit for a one-of-a-kind experience. At McMurry, students develop confidence and communication skills. They are equipped to exceed expectations and go on to make their mark through scholarship, leadership, and service. McMurry is dedicated to making a strong education possible by awarding federal, state, and institutional aid. This year, over $10 million of financial aid was distributed to over 82% of students. While McMurry is a private university, financial aid packages make a McMurry education a great value that is well within reach and tailored to fit your individual needs. Comprehensive awards can vary greatly, ranging from $5,000 to well over $27,000 per year based on individual qualifications and demonstrated financial need. This year, students received total aid packages (including scholarships, loans, and grants) averaging over $26,000 per year. 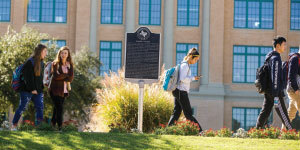 At McMurry, learning is active and personal. Here you will engage in small classes led by expert professors. You will collaborate on team projects. You may conduct high-level research. You might experience the real world through an internship. You may even study abroad. Our low 13:1 student-faculty ratio means more leadership opportunities, more discussion and debate, and more engaging in your own learning and success. Immersing yourself in college life at McMurry offers you the opportunity to achieve your full potential. You will be challenged at McMurry, but you will be supported too. Our professors care about each student’s success, and they will go the extra mile to help you. It’s these close mentoring relationships that empower our students to step out, take risks, and achieve at a level they may have never thought possible. U.S. News & World Report ranks McMurry University #12 in its 2018 list of “Best Regional Colleges in the West.” Within this category, McMurry also ranks #7 in “best value” schools, #5 in best ethnic diversity, #6 in best economic diversity, and #9 in best colleges for veterans.